Several friends, like you, have told me of recipes on this site that you’ve tried and enjoyed. Thank you, I love the feedback! One recipe, in particular, that I’ve received quite a bit of positive feedback about is my Mediterranean Farro Salad. It seems to have become a regular dish in many of your homes and I’ve been so pleased to hear about it. This week I was inspired to revisit the flavors and textures of my Mediterranean Farro Salad after another friend mentioned making it again. What I had in mind was something similar, but completely new—a grain-free version. 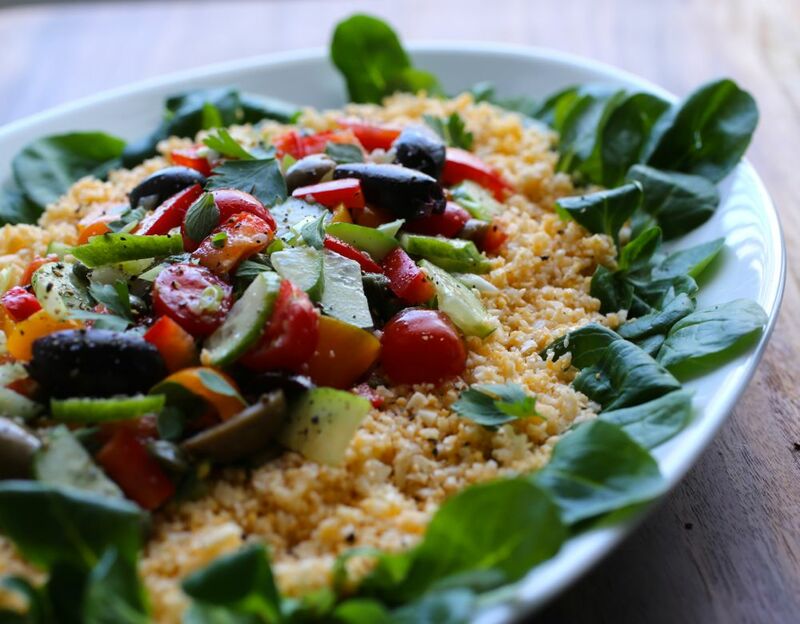 I decided to use cauliflower, instead of farro, pulsing it into couscous-like granules, and then serve it on a bed of greens along with many of the other vegetables (those often found in a colorful Greek salad) that were also in the original salad. 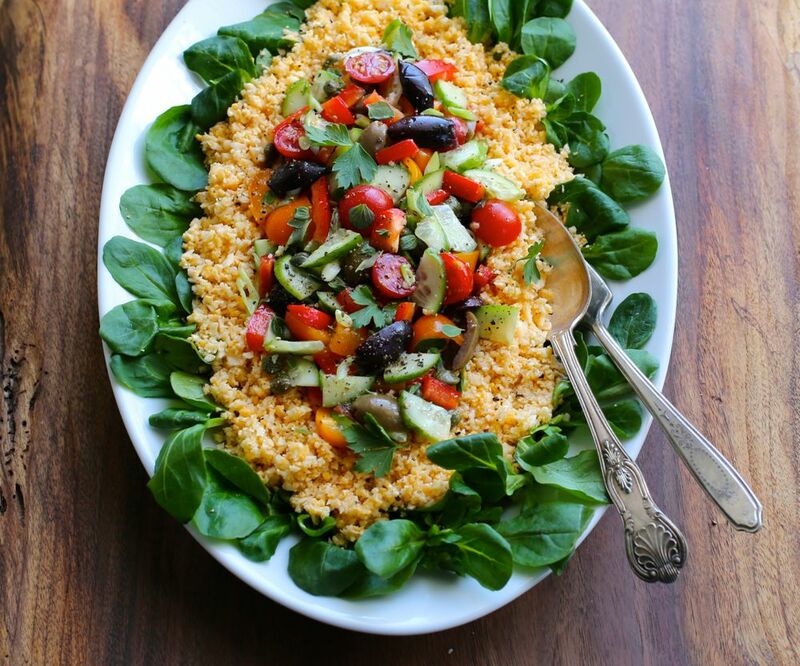 The cauliflower-couscous adds wonderful depth. It provides texture, but because it’s still cauliflower, the salad is quite light and easy to digest. I used mâche for greens, but feel free to use a spring mix, baby spinach, or your preference of salad greens. Also, I used orange cauliflower, but feel free to use white cauliflower if that’s what’s available to you. A simple vinaigrette is what I came up with for this salad, but I also tried it with the original salad dressing I made for the Mediterranean Farro Salad. Either dressing works very well here! Although both salads have similar names, are summery, light, colorful, and quite refreshing, they are completely different—in appearance, flavor and texture. 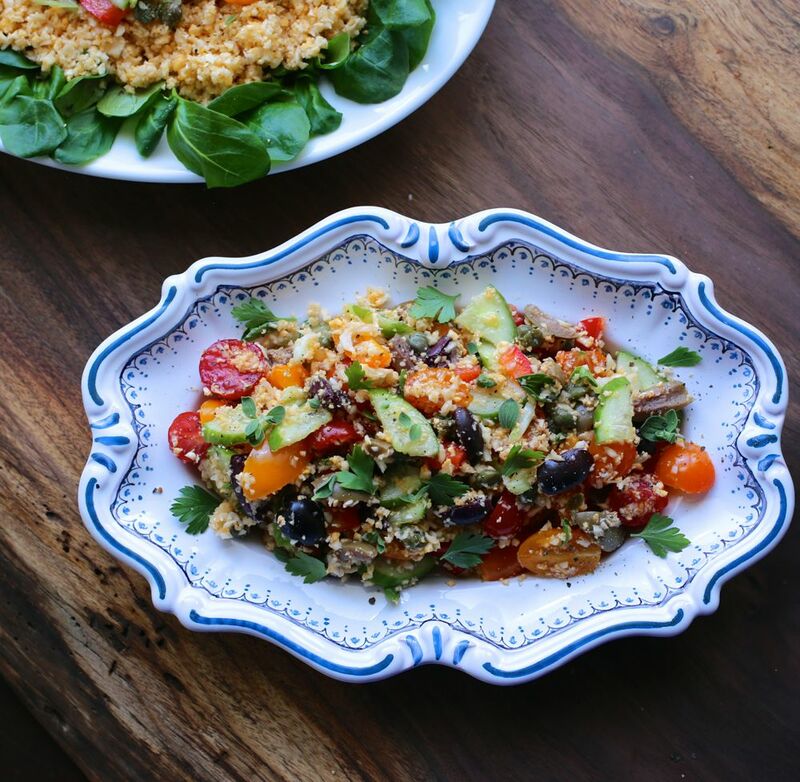 I hope many of you like this salad as much as you liked the version with farro. I’d love to hear your thoughts on it! Make the dressing. Whisk together all ingredients and set aside. Taste and adjust. Set aside. Trim and break apart the cauliflower into large florets. Transfer the cauliflower to a food processor—if necessary, process in two batches—and pulse the cauliflower in 1-second pulses until it breaks down into couscous-sized granules. If you don’t have a food processor, you can use a box grater to grate the florets. 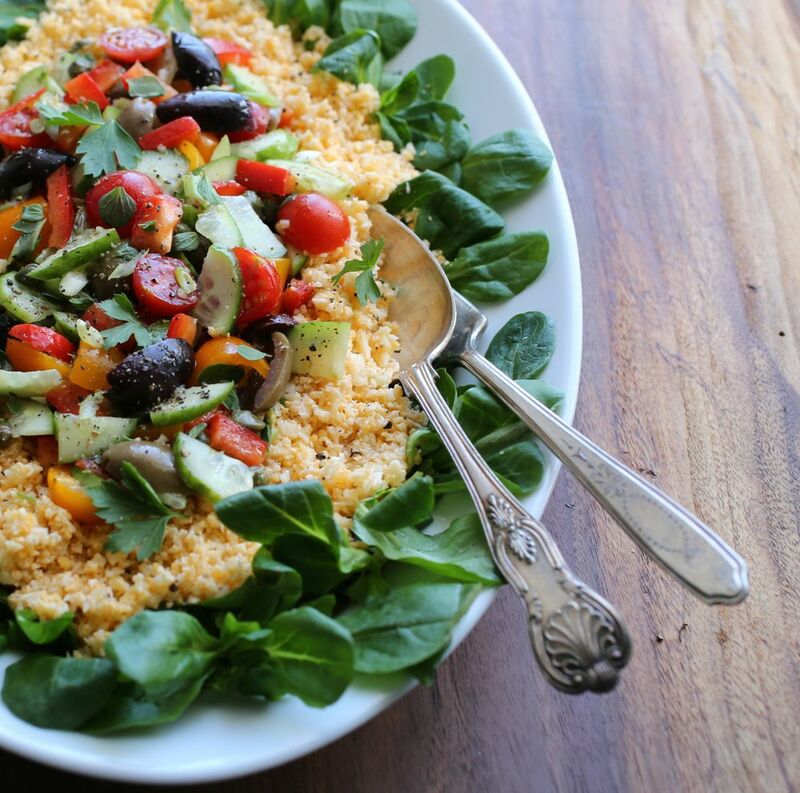 You should have approximately 2 cups of cauliflower-couscous. Transfer to a bowl and toss with about half of the dressing. Taste and adjust seasoning, if necessary. In another bowl combine tomatoes, olives, bell pepper, green onions, cucumbers, capers, and oregano leaves. Gently toss with remaining dressing. Taste and adjust seasoning, if necessary. To assemble as shown in photos: Line your serving dish with your salad greens. Frame an inner rim with the cauliflower-couscous. Add the rest of the salad to the center. Garnish with freshly ground black pepper and parsley. Another option for assembly is simply to toss everything together (small dish in photos above) in a large bowl and serve.